A School's iPad Initiative Brings Optimism And Skepticism : All Tech Considered Coachella Valley Unified, a predominantly low-income, agricultural school district in California, is giving every student an iPad. The initiative highlights the problems that districts across the country are facing as they attempt to bring personalized, digital learning to their schools. 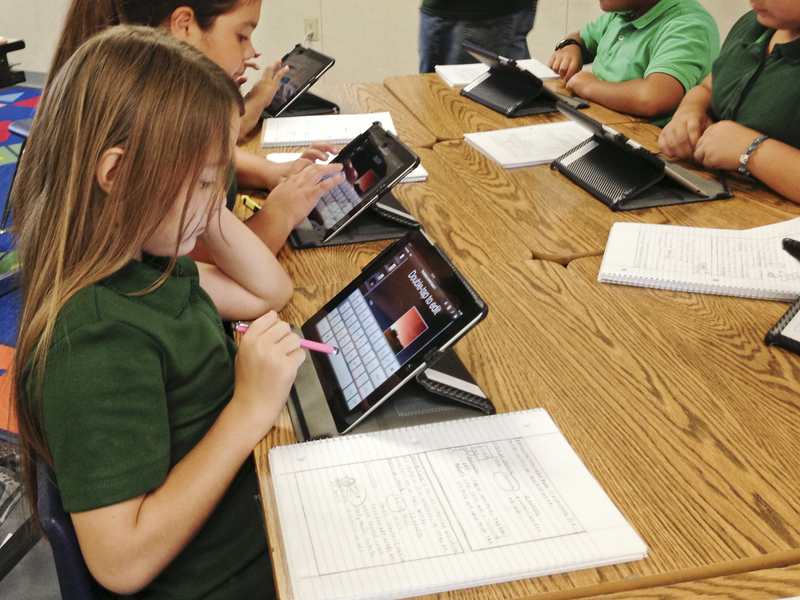 Students at Coachella Valley Unified School District use iPads during a lesson. The district's superintendent is promoting the tablet initiative as a way to individualize learning. One of California's poorest school districts, the Coachella Valley Unified southeast of Los Angeles, is currently rolling out iPads to every student, pre-kindergarten through high school. It's an ambitious effort that administrators and parents hope will transform how kids learn, boost achievement and narrow the digital divide with wealthier districts. But, as with tablet efforts across the country, this one faces skeptics and obstacles. Some wonder if its projected benefits are being grossly oversold. Before becoming Coachella Valley's superintendent of schools, Darryl Adams was a keyboardist and singer with the '80s pop rock band Xavion. It was a one-hit wonder, complete with '80s hairdos and a slot on a Hall & Oates tour. He says it was the first all-black rock band on MTV. Today, Adams still has a touch of the showman as he talks about his school district's latest project. "Everyone will have an iPad!" he says with a broad smile. "It's gonna be exciting!" Music was Adams' passion when he was young; it was what inspired him in school. And he sees the iPad plan as central to exciting kids in school today. He argues that since the federal No Child Left Behind initiative 10-plus years ago, school districts have often failed to inspire kids. Instead, he says, they've been teaching them how to take tests. "And that's not what education is about. So for the first time in our history as a nation, I think in the world, we're going to be able to individualize and personalize education," Adams says. The district has leased the tablets from Apple at a cost of nearly $9 million. Voters here approved a bond issue, backed by property taxes, to pay for most of it. Funds from Title I — a federal program designed to help low-income schools — and from California's Common Core initiative are also being used for training and implementation. Some 80 percent of kids in his district live in poverty, Adams says. He sees the tablet plan as a civil rights issue, noting that the bond measure passed with nearly 70 percent support. "Some of our families live in trailer home parks. Some are migrant farmers," he says. "But they're putting money on the line for each other, and that's a true indication the community cares about each other." The district has set up headquarters in a trailer to coordinate the massive distribution of nearly 20,000 iPads and accompanying training, security, curriculum changes, parental consent forms, and more. Inspirational quotes dot the walls — not from famous educators, but from Apple's late founder, Steve Jobs. Matt Hamilton, the district's educational technology coordinator, says educators and students are learning from each other. "No one is the expert anymore," he says. "The whole paradigm has really shifted. Teachers are no longer the possessors of knowledge. They're more the facilitators of learning." Students in seventh grade and up can take their tablets home on evenings, weekends and every school break except summer. Sixth grade and below will have to leave the devices in a locked classroom cart. The whole paradigm has really shifted. Teachers are no longer the possessors of knowledge. They're more the facilitators of learning. The district set up a training program to highlight the best teaching practices and to brainstorm classroom curricula. Music teacher Michael Richardson, one of 120 pilot teachers, says he has involved students in figuring out the devices. One student, for example, found a promising music app and "he taught the class and taught me. It was kind of great," Richardson says. Middle school English teacher Patricia Inghram was also in the pilot program, which tested the tablets in every grade and every subject matter throughout the district. She says she's been using them extensively and successfully in her classes for more than a year. Even though she's a longtime teacher who started out teaching on chalkboards, she says, "I feel comfortable enough to use it at this point, and I think they're fantastic tools." High school geometry teacher Patrick Beal says the challenge is to make the tablet more than a glorified notebook. "The goal is to transform what I do in the classroom into something completely different: to take them outside of class, spark curiosity and inspire the learning process," he says. It's not clear how many schools or districts across the country are using tablets in the classroom. The U.S. Department of Education doesn't track the number, and an Apple spokesman declined to comment or provide numbers on how many schools have worked with iPad classroom initiatives. Some districts have publicly stumbled with their initiatives. Los Angeles Unified students easily got around restrictions on their district-issued iPads last month: They simply deleted their personal profile info and then could surf the Web without restriction. LA quickly put on the brakes on its billion-dollar iPad rollout to boost security and make other changes. Several other districts across the country have also delayed their tablet plans because of security concerns. Coachella Valley is trying to learn from LA's problems. It's working with Apple to strengthen profile security and will block harmful and inappropriate online content, as required under the rules for districts that receive federal tech dollars. For now, social media sites and YouTube will not be blocked. Inghram says some security measures should be a classroom management issue. She has kids take a "tech oath" on digital citizenship and proper use of the iPad: no cyberbullying, harmful or inappropriate pictures or content, or social media during class time. Some of the projects she's done in class include using the tablets to produce podcasts and link via Skype with experts at the Edgar Allan Poe Museum. Her favorite: virtually visiting the historic Globe Theatre in the U.K. during a lesson on Shakespeare. Many of the kids never leave the area, Inghram says. "But being able to talk to someone who is sitting in the Globe Theatre and show them around the building and answer their questions about Shakespeare while you're reading his sonnets is an experience that, you know, it opens their eyes." But some teachers, parents and kids worry that there's a kind of iPad boosterism here that borders on naive. While school district officials are promoting the tablets as central to improving academic achievement, research on that so far is mixed at best. At Coachella Valley High School, one of two high schools in the district, junior Cheyenne Hernandez says she's open to new media in the classroom but wonders if the iPad money might be better spent on other things. She says people will most likely steal them, break them or wear them out. "And in a student's opinion, most of the kids are going to go on Facebook, Twitter, Instagram," she says. That's where I see the difficulty. The disconnect is between giving students an iPad to use and making it relevant to the classroom. And it's not clear how the district will integrate the curriculum with its ambitious tablet plan. Coachella Valley wants to make the iPads a central part of efforts to meet new Common Core state standards for math and English, and there are new Common Core apps coming out regularly. But the head librarian of Desert Mirage High School, Rebecca Flanagan, wonders which ones the district will use, how well it will work and how it will all be integrated into a coherent plan. "That's where I see the difficulty. The disconnect is between giving students an iPad to use and then making it relevant for the classroom," she says. "I mean, it's a toy for them." Perhaps the biggest bug is connectivity: Large parts of the Coachella Valley are not covered by high-speed Internet. And even where it is available, many families here simply can't afford the service. Tenth-grader Eli Servin is in a special education class at Coachella Valley High School. His teacher says he "really blossomed" using the iPad at school to help coordinate a recycling project. But at home, he has no Internet connection unless he's connecting to a hot spot on his sister's cellphone or using the Wi-Fi connection at a local McDonald's. The district is using funding from the bond measure to boost Internet capacity and accessibility for its far-flung schools. But Adams, Coachella's superintendent, acknowledges that expanding connectivity to homes, especially in the district's many rural and impoverished pockets, will be much harder. "I've told my staff: If we have to park a bus in the neighborhood with a Wi-Fi tower on it or whatever, we will do that to make sure that our students are connected," he says. It's one of many issues that schools across the country will be intensely observing as the former pop rocker tries to pull off his biggest show yet.